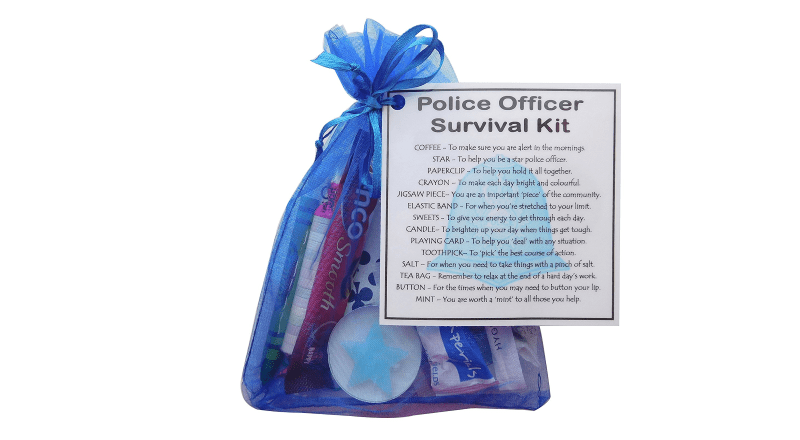 Get this bag of novelty items that show how a loved one cherishes the Police Officer in their life! A bag of items that reflect the daily struggles, situations and strengths of a Police Officer! Each bag contains one item listed on the label. Ideal for wedding present, gift or birthday present. COFFEE – To make sure you are alert in the mornings. STAR – To help you be a star police officer. PAPERCLIP – To help you hold it all together. CRAYON – To make each day bright and colourful. JIGSAW PIECE- You are an important ‘piece’ of the community. ELASTIC BAND – For when you’re stretched to your limit. SWEETS – To give you energy to get through each day. PLAYING CARD – To help you ‘deal’ with any situation. TOOTHPICK- To ‘pick’ the best course of action. SALT – For when you need to take things with a pinch of salt. TEA BAG – Remember to relax at the end of a hard day’s work. BUTTON – For the times when you may need to button your lip. MINT – You are worth a ‘mint’ to all those you help.